On Thursday 11th February our head chef, Stephane Delourme and head pastry chef, Stuart Pate from The Seafood Restaurant joined Padstow School to talk about healthy eating. 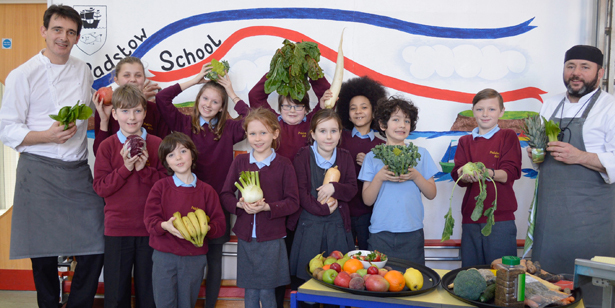 As part of the school’s ‘healthy eating week’ initiative, our chefs teamed up to talk to local students, years three to six, about which types of foods to eat and eating in moderation. They delivered top tips to the children on how they could incorporate healthy foods into their diet, from seeds sprinkled on their cereal in the morning to replacing sugary snacks with fruit and vegetables. After a guessing game where the children identified all the fruit and vegetables they could recognise, Stephane cooked up some mackerel, salmon and tuna fishcakes and Stuart made a boat from a slice of melon, a cocktail, slice of blood orange and a strawberry sail as well as a show stopping mango hedgehog, all of which the children then tucked into. Thanks for having us Padstow School, we had a great time!